The controversy that has resulted from the collision between Mercedes drivers Lewis Hamilton and Nico Rosberg during the early stages of Sunday's Belgian Grand Prix is gold dust for Formula 1. This is an emotional roller-coaster. This is man and machine on the edge with high-pressure stakes. And Mercedes are doing a very good job of giving the public exactly what they want. The incident was messy and responsibility for it lies with Rosberg. Hamilton was entirely blameless. He took the normal racing line, as he was entitled to do, and did not try to squeeze Rosberg. I stand by what I said in commentary that Rosberg was of the mindset: "I have to show Lewis that I am not prepared to keep opening the steering in these situations." He opened the steering in Bahrain and Hungary, because he had no choice, and that's what he should have done in Spa, because again he had no choice. As it was, he did open the steering. Then, when he realised he was going to run off the circuit, he turned back in again and, in a clumsy manoeuvre, clipped Hamilton's rear tyre with his front wing, causing a puncture. It's easy for people sitting outside the cars to say Rosberg deliberately hit Hamilton's rear wheel with his front wing. But I cannot believe for one moment a driver would consciously damage his own car. Drivers know you can't nudge someone with your nose, because you lose your front wing. It's just not a viable strategy. There is also no way a driver can judge where exactly to hit a rival's tyre with his wing to guarantee a puncture. Rosberg has taken a big hit in the popularity stakes as a result of this. People have also taken Sunday's incident - and the words spoken after it - and linked it to what happened in Monaco qualifying, where the rift between the two really started. But I don't think for a second Rosberg thought he was going to puncture Hamilton's tyre. He was just clumsy. Rosberg wanted to prove a point, to be more robust with Hamilton. This was his first opportunity, but he was a bit ham-fisted and got it wrong. Why? Because he is just not as good a wheel-to-wheel racer as Hamilton. If you need someone to play the percentages, keep calm, put the pressure on a team-mate by intelligently managing a race weekend, you'd pick Rosberg. But if you had to choose someone to muscle his way from the back of the grid to the front on a difficult track, you'd choose Hamilton. Rosberg is a fast driver, an intelligent guy who is leading the world championship, but he will not win these sorts of fights with Hamilton. You have to play to your strengths - and his are not toe-to-toe racing. I still think the race stewards did the right thing at the time by not imposing any penalties during the race. If we want the drivers to race hard, then it's right that, under those circumstances, the stewards decide to let it be. However, Sunday's incident had huge consequences for Hamilton, so, arguably, the stewards have to have a back-up plan. Should they take a different view of such instances when they occur between two title rivals? Arguably, yes. Rosberg caused this incident and has badly affected Hamilton's title chances. In that scenario, there should be something that helps neutralise the consequences, especially in a championship year. "Drivers have to be full and frank with their teams, whether it makes someone happy or it makes someone sad"
Otherwise, two drivers can go to the last race and the one ahead on points can take the other guy out. A world championship is so important that someone would do that. It has happened before and it could happen again. No-one wants to see that. 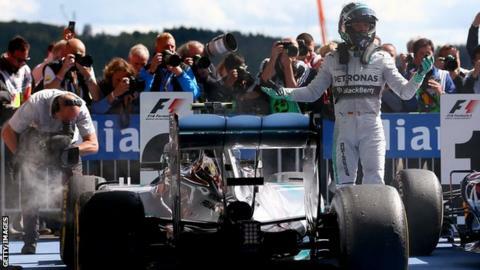 Should Rosberg have said he wanted to make to prove to Hamilton he can't be pushed around? If that is what he feels, he should say it, within the confines of the team. Should Hamilton have told the outside world what was discussed in that post-race meeting on Sunday? In the interests of the team, arguably not. But then, in the interests of the team, Rosberg should not have been racing him at that point. Drivers have to be full and frank with their teams, whether it makes someone happy or it makes someone sad. It is the only way it can work. That's exactly what we did at McLaren on the occasions I crashed into Mika Hakkinen. I spoke my mind with Mika and team boss Ron Dennis. We argued and all the rest of it. But when we came out of that room into the public, Mika would say nothing and I would toe the company line. The key difference here is that we already know that Hamilton is more difficult to manage from a team point of view than Mika or I were. A couple of years ago, he tweeted a picture of confidential information about telemetry when he had been out-qualified by McLaren team-mate Jenson Button at Spa. The only other person to do something to the detriment of the team is Fernando Alonso, when he was driving for McLaren. Mercedes have to know Hamilton has that potential. During the race at Spa, we saw Mercedes motorsport boss Toto Wolff and non-executive chairman Niki Lauda in discussions with Mercedes board member Prof Dr Thomas Weber. When they eventually made a public statement about what had happened, they were all very firm in saying that what Rosberg had done was not correct. I was surprised by that, because teams tend to want to look after their troops as best they can and we are used to hearing them say: "It was unacceptable they crashed together, but we will deal with it internally." The fact they did not do that is obviously a bit of a slap in the face for Rosberg, but we should admire Wolff and Lauda for having the strength of character to say what they did if they think a driver has messed up. Just because Lauda, a three-time world champion, has been there and done that and just because Wolff is the boss doesn't mean they have control over these guys. They can influence the drivers and lay down the law of the team, but they can't control what they do in the car, any more than Frank Williams could control Nigel Mansell and Nelson Piquet or Dennis could control Alain Prost and Ayrton Senna or Hamilton and Alonso. Some things in life you just accept you cannot do. You cannot herd cats, you cannot control a volcano and you cannot control two top racing drivers in the same team. If you can, you probably have the wrong drivers, because you don't have the spark that makes them great. Mercedes have employed two number one drivers and nothing Wolff or Lauda can say to them will stop them going out and racing. All the team can do is give their opinion and continue to be unusually honest in their approach. The public does not want PR nonsense. They don't want drivers talking generic rubbish. The modern world is about instant information and live high-definition video streams. People make their own minds up long before team bosses say anything. Wolff and Lauda should be applauded for being honest and, in the interests of the sport and of Mercedes, they should carry on doing exactly what they're doing, because this is fantastic for everyone. Hamilton and Rosberg are this decade's Senna and Prost. This year is a 1988 or a 1989 for the 21st century. It is a season that will go down as an all-time classic and we should savour the fact that Mercedes have been prepared to let it happen. Let's hope that carries on being the case. David Coulthard is a 13-time grand prix winner. He was talking to BBC Sport's Andrew Benson.